The gliding nature and dynamic planes of the face present one of the great challenges in aesthetic surgery and volume replenishment is a key component of the treatment algorithm. Facial Volumization: An Anatomic Approach by Jerome Lamb and Christopher Surek masterfully bridges the gap between the anatomy lab and injection clinic. It synthesizes a large body of facial anatomy publications into a "one-stop shop" covering a wide array of facial procedures - from the chin and perioral - to the midface and temple. In addition to vascular injury, lymphatic disruption can play a critical role in suboptimal aesthetic facial volumization outcomes. Chapter 2, The Lymphatic Anatomy of the Lower Eyelid and the Malar Region of the Face discusses new state-of-the art facial lymphatic discoveries. 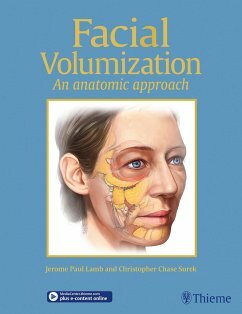 Key Features Numerous beautiful, full-page color illustrations systematically reveal each layer of the face - from deep to superficial - taking readers on a unique journey through the 3-D architecture of complex facial anatomy. The left side of each page features a written synopsis of the vascular, muscular, ligament, and adipose components of specific layers paired with cadaveric dissection photographs. More than 20 high-definition live patient injection videos posted in the Thieme online Media Center include detailed injector commentary. Augmentation and enhancement techniques, the latest facial fillers and lip injections, and illustrated guidance on preferred volumization approaches. Identification of danger zones and technical pearls for injecting safely, avoiding problems, and obtaining the best results. This invaluable resource will help residents and seasoned plastic surgeons, facial plastic surgeons, dermatologists, otolaryngologists, and aestheticians perform facial injections safely and achieve optimized results.